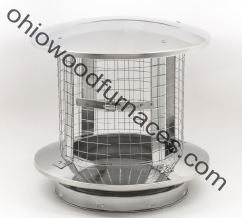 6" stainless steel spark arrestor chimney cap for chimney sections used on Maxim 175/250/255 P/255 PE models, E-Classic 1450 models, Classic Edge 350/550 models and Forge 1500/3500 models. New version chimney cap/spark arrestor provides better fit, features a snaplock clamp and screen that is secured with a clamp-on fastener for easy removal. Available for 6" and 8" chimneys.